ASIA’S BEST RIDESTHE K-POP WAVE IN LA! AEG LIVE, SM ENTERTAINMENT, and POWERHOUSE are proud to present the SMTOWNLIVE ’10 WORLD TOUR in Los Angeles at the world-famous STAPLES Center onSaturday, September 4th at 7:00 PM. This concert is a part of SM Entertainment’s world tour project which willbegin in Seoul, then continue to LA, Tokyo, Shanghai, and other major Asiancities. It is the first time that AEGLIVE, one of the largest concert promoters in the world, is hosting an Asian concertat STAPLES Center. The SMTOWN LIVE ’10 WORLD TOUR will go beyond Asia and take place globallyas a grand music festival featuring top-notched artists from SM Entertainment,one of the largest artist management agencies not just in Korea but in Asiaoverall. With STAPLES Center being the Sports and Entertainment Center of the World, theLos Angeles show will create an unimaginable experience and compellingatmosphere that fans of all ages can enjoy. In particular, the magnificentstage production and various joint performances by top artists that are only tobe seen exclusive in SMTOWN LIVE are expected to be a hot issue amongst K-popfans. 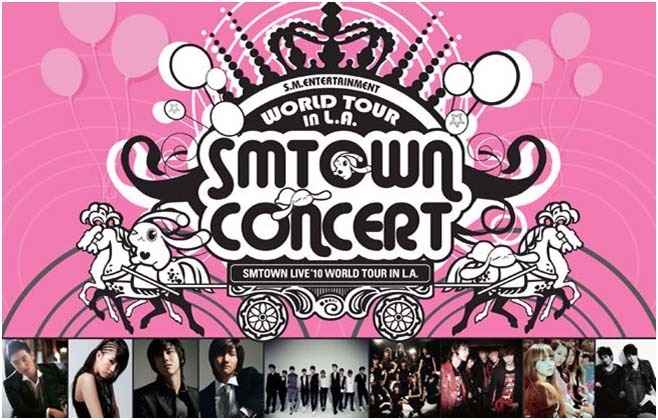 SMTOWN LIVE has already been imprinted as Asia’s leading concert brandthanks to its successful tour in 2008. Now in 2010, music fans will be captivated by an upgraded concertproduction that involves the most sought-after artists. Since the SMTOWN LIVE ’10 WORLD TOUR is taking place in Los Angeles, fansin the US will finally get an opportunity to be a part of the greatest Asianconcert of the year! ** Be the first to hear the latest updates on thisconcert by joining our email list (http://powerhouse.fanbridge.com), following us on Twitter (http://twitter.com/powerhouselive), and liking our page onFacebook (http://www.facebook.com/pages/Los-Angeles-CA/POWERHOUSE/71968914565).